Brunch, in my opinion, is the best time of any day. All-you-can-drink breakfast options just makes brunch even better! For the best bottomless brunch deals in Daytona Beach, check out this full list to get your weekend off to the best start. Open from 7 a.m. to 4:30 p.m. everyday, Adam's Egg is a staple in Daytona Beach. Their bottomless brunch deal is $22 for bottomless mimosas with any breakfast entree! This deal isn't one to be beat. From chocolate chip pancakes and zucchini (yes, zucchini) pancakes to the cheeseburger omelette and apple pie french toast, Adam's Egg has you covered. If you aren't in the mood for breakfast, Adam's Egg also has lunch dishes, too. Yelp gives Adam's Egg a 1 dollar sign, so it won't break the bank for brunch! Open everyday from 11 a.m. to 10 p.m. and midnight on Friday and Saturday, Caribbean Jack's has an oceanside atmosphere and relaxed environment. Their bottomless mimosas flow and pair effortlessly with any of their seaside-inspired entrees, or try their Bloody Mary which not only has pepperoni and mozzarella cubed on top but also a shrimp tail! Caribbean Jack's doesn't have a traditional breakfast menu of pancakes and french toast, but what they lack in brunch-themed dishes, they make up for in their wide array of coastal entrees. Where the motto is "eat, drink, and be... Mary," you'll leave nothing short of merry! 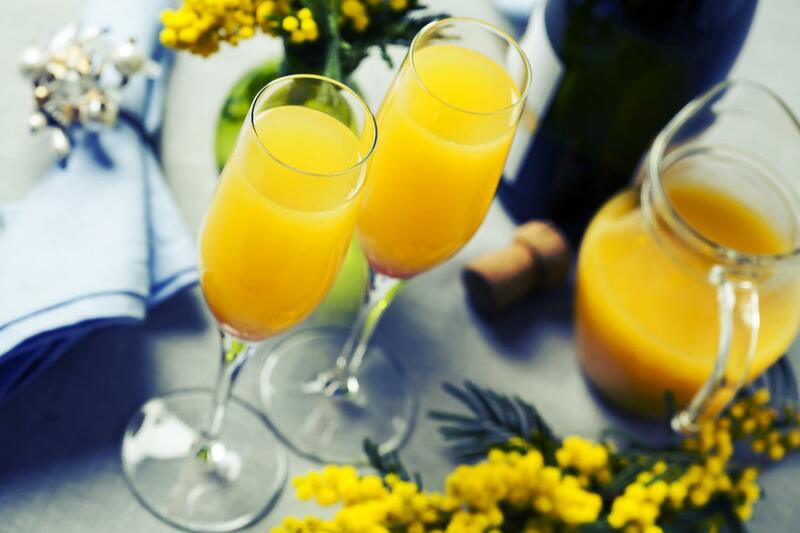 What's even better than bottomless mimosas and brunch? Bottomless mimosas, brunch, and a drag show! Their brunch is buffet-style, so you can eat as much as you want and wash it down with endless mimosas all while eating in the dark blue and purple-lit ambiance from the show which starts at 1:30 p.m. Grab your heels and sequin skirts and dine at one of the most fun places in Daytona Beach. For a more upscale brunch with specially-selected ingredients, Flagler Tavern's award-winning culinary team creates delicious entrees using only the finest of ingredients like fresh wild-caught seafood, hormone and antibiotic-free chicken, artisan breads, and Florida-raised beef. Flagler Tavern offers $12 bottomless mimosas, and you can choose from orange, blood orange, pineapple, and cranberry juice! Brunch is served on Saturday and Sunday from 10 a.m. to 1 p.m. From the Lobster and Eggs to the Three Breakfast Tacos, you're in for a treat! One thing's for sure, you get your money's worth at the Grind Gastropub and Kona Tiki Bar. Their brunch menu is only served on Sundays from 10 a.m. to 2 p.m. They have a Bloody Mary bar for $8 per drink, which allows you to pick your vodka and all of your toppings. They also offer a brunch buffet for $14.95 per person, and bottomless mimosas are only $10 per person! Whether breakfast or lunch is more your style on the weekends, all of these Daytona Beach restaurants with all-you-can-drink brunches offer a wide variety of dishes to curb anyone's cravings! Find more restaurants in Daytona Beach by registering on 386area and stay up-to-date on all things in the Daytona Beach area.